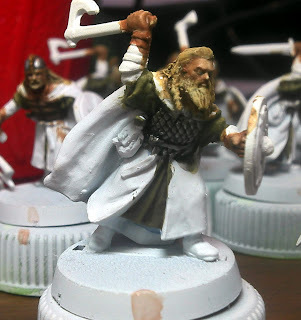 For me the prepping process of getting miniatures ready to paint can really be a drag especially for an army. 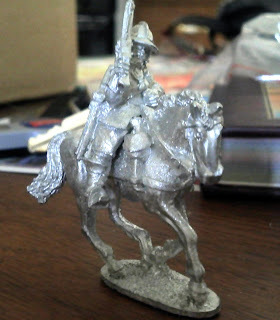 I was hoping to have all the Bicorne Miniatures Cavalry ready to prime by today. That is not going to happen, between working late every night this week and discovering that the previous owner must have used a bottle of glue on each one he assembled progress has been slow. Not being able to get the riders off is going to cause a little bit more work when I go in to airbrush the horses, I'll just have to mask them off or be a little more careful with them. I'm also going to try a different technique with these. I was reading the Metal Mountain blog (http://themetalmountain.blogspot.com/) and he uses the oil rub technique. 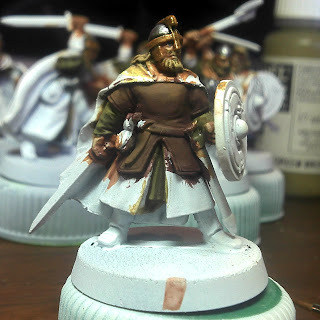 He applies a colored primer (brown in this case) and their first dark shade with the a heavy, heavy wash of burnt umber (I think, I'll double check that before I do it) which is then rubbed off before it dries completely . I really like this look on his ECW miniatures so I'm going to give it a try on mine and see how it goes. I see similarities between his technique and my own style so I'm hoping I can pick it up pretty quick. The main difference will be that I'm going to try it with the water soluble oil paints and see how that works. 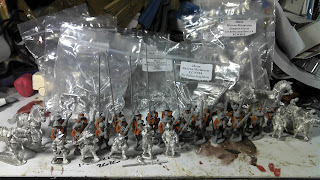 I had hoped to have these miniatures ready to paint this weekend but since I didn't quite get to the priming step last night with the first dozen cavalry that's not going to happen. Looks like my LoTR Helmingas are going to get some brush work instead. 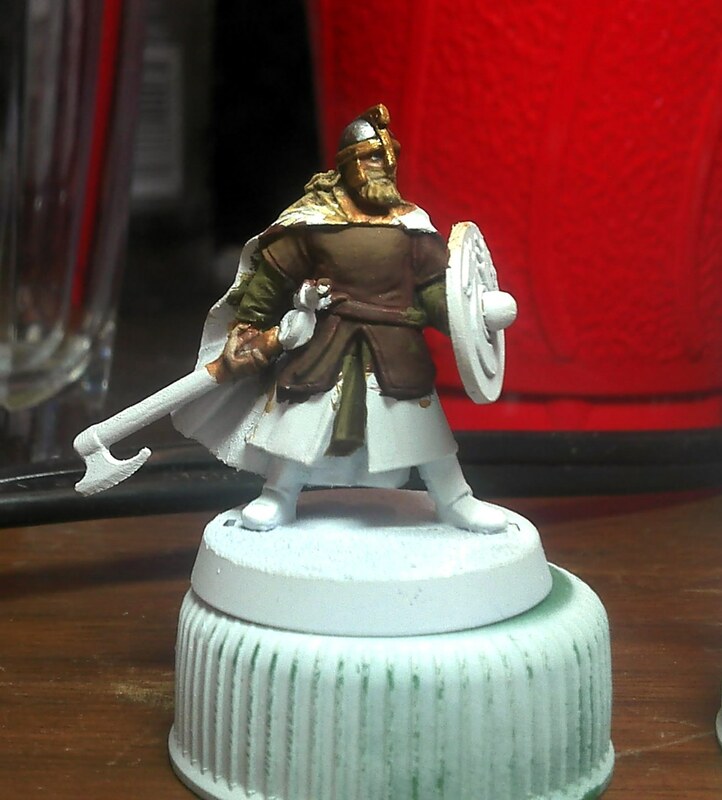 For those who may have missed it this little guy is most likely ECWC-004 from Bicorne Miniatures. Now I'll get some guys with Carbines in their hands to round out the unit. 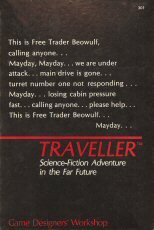 Way back in my posts is one about games that define us, included in my list was Traveller (now referred to as Classic Traveller) published by GDW. I haven't paid much attention to the Kickstarter projects out there but I stumbled on a Traveller 5th edition project by Marc Miller (the original creator). I'm pretty stoked about this one so I'm going to through into support my first Kickstarter project and get my hands on the version that Marc says will do everything he wanted to do. I would have heard about this project sooner if my friend Clay Bush was still alive, he loved the game and played through every edition, participated in play testing most of them and ran convention scenarios all the time. Unfortunately Clay passed away in 2007 from acute anemia (literally he was getting complete blood transfusions every three months). When I get the new book and run my first adventure it will be dedicated to Clay, heck it might even be one of Clay's he would have like that. I have been going through these miniatures this weekend and picking out which units I would like to have ready for the army painting competition at the convention. 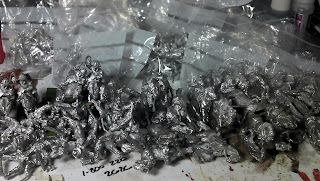 I was sorting through the cavalry first. 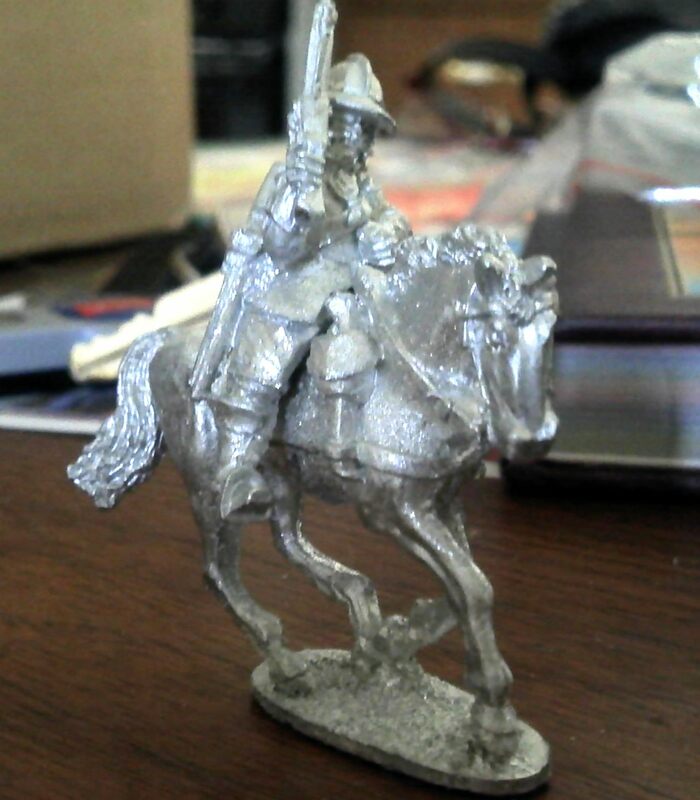 There is a ton of Wargames Foundry Cavalry in here and its significantly smaller than the Bicorne Cavalry. 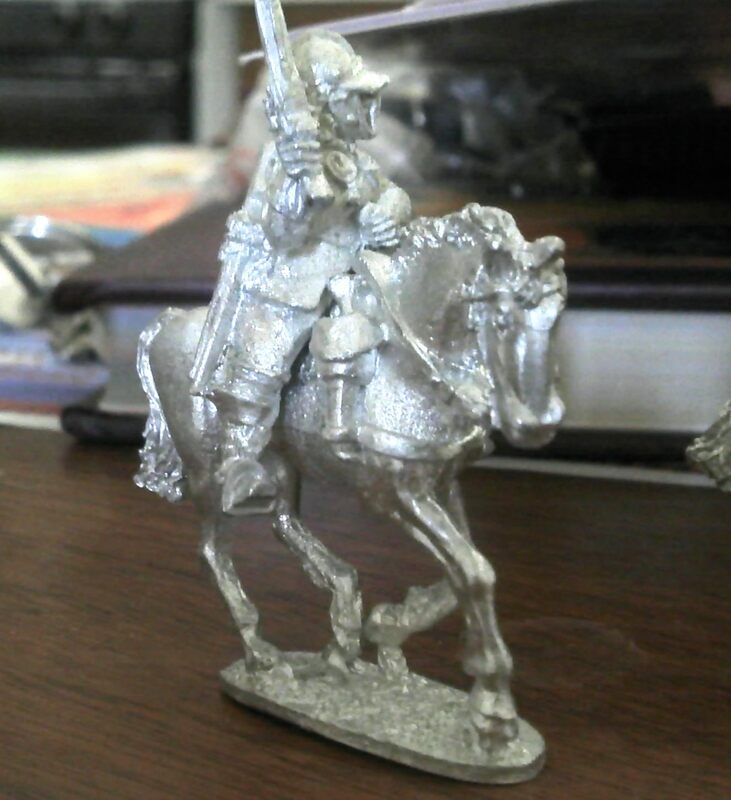 In addition at least half the horses are missing for the WF Cav. Which is a shame, I'll have to see if they will sell me just horses. 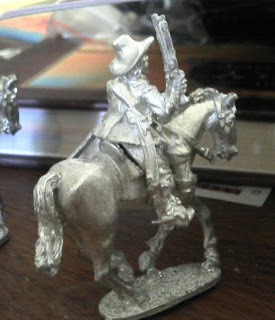 Sorting through the Bicorne Cavalry I'm definitely going to have to purchase some packs to fill out the units. There is a Danish army list in FOG; Wars of Religion Western Europe 1610-1660. In this list is a requirement for a unit of Arquebusiers which is armored (or unarmored) horse with carbines. There are eight loose miniatures that look like they would fill out this unit pretty well, unfortunately I have no idea what the Bicorne stock number is nor does Bicorne have picture of all their minis in their shop.Even if these guys are pictured it would be almost impossible to tell if they have carbines from the front photo that Bicorne has of their miniatures. These guys are in buff coats with pistols in hand, and carbines slung. Does anyone know what the stock numbers for these are? 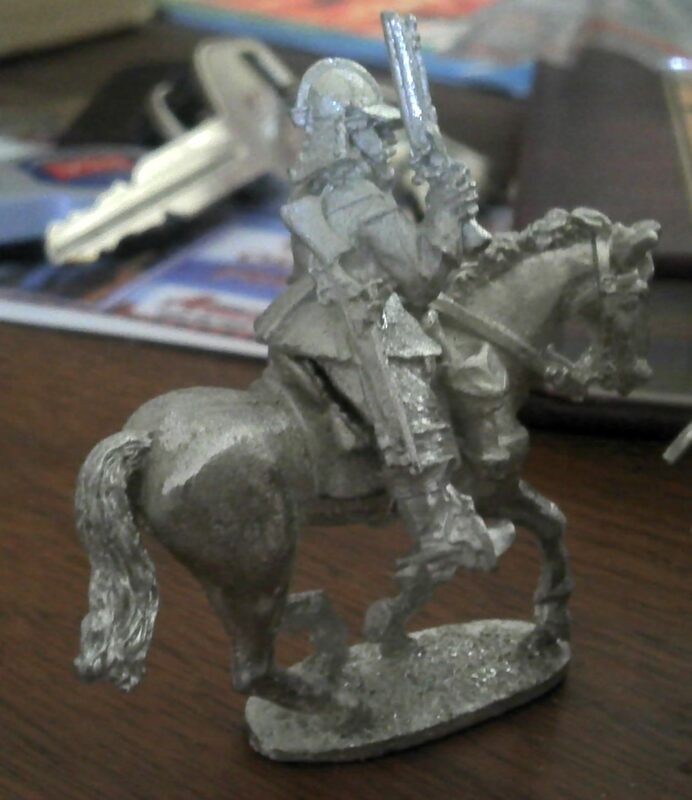 These have been identified: ECWC004 (Trooper w/ Pistol, Buff Coat, Mixed Headgear). I will fill out the unit with ECWC019 and ECWC020 which are actually holding the carbine instead of the pistol. There are four figures here with kind of front and rear quarter shots. The Thirty Years War is a period that I have always wanted to do and a year or so ago I picked up the FOG rules and Warlords plastic stuff. 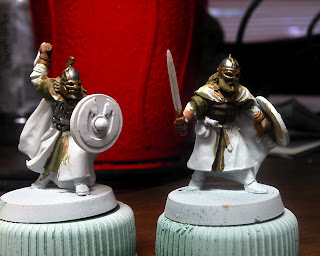 I got a lot of that together and just decided that I didn't like the looks of the plastic and they weren't much fun to paint so they fell to the wayside. 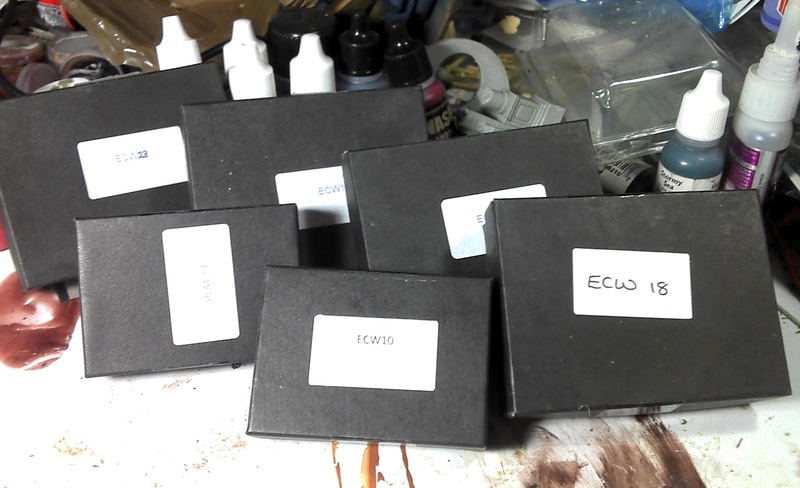 Over the last two nights I have picked up a couple of collections of ECW/TYW miniatures, mostly Bicorne and Wargames Foundry with some Perry Miniatures and Warlord Games thrown in for good measure. The first box came from California with a very odd mix of troops in it, like a dozen three horse artillery limbers but no artillery pieces and about 40 officers but only in 3 poses (and what am I going to do with that many officers anyway?). 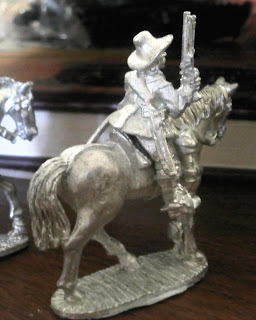 I think what really made it worthwhile though are the 94 Cavalry miniatures. 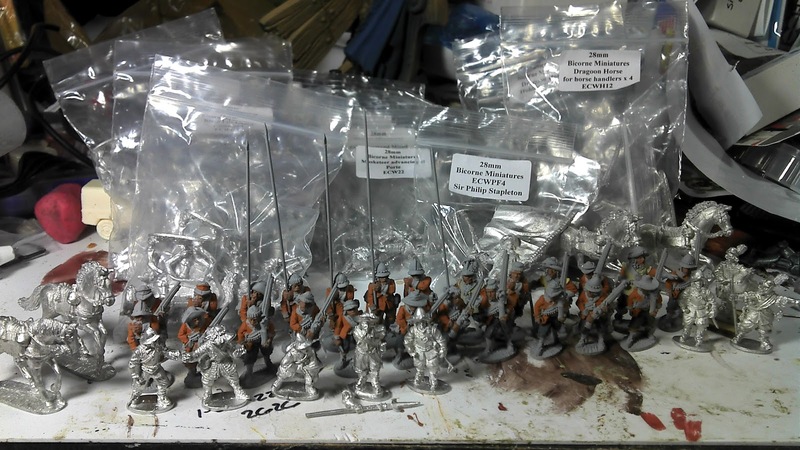 About 2/3rds are Bicorne and the rest are Wargames Foundry. I have pawed through the foot troops and there should be plenty of musketeers but there doesn't seem to be enough pikemen. Will do some more sorting of these over the weekend. 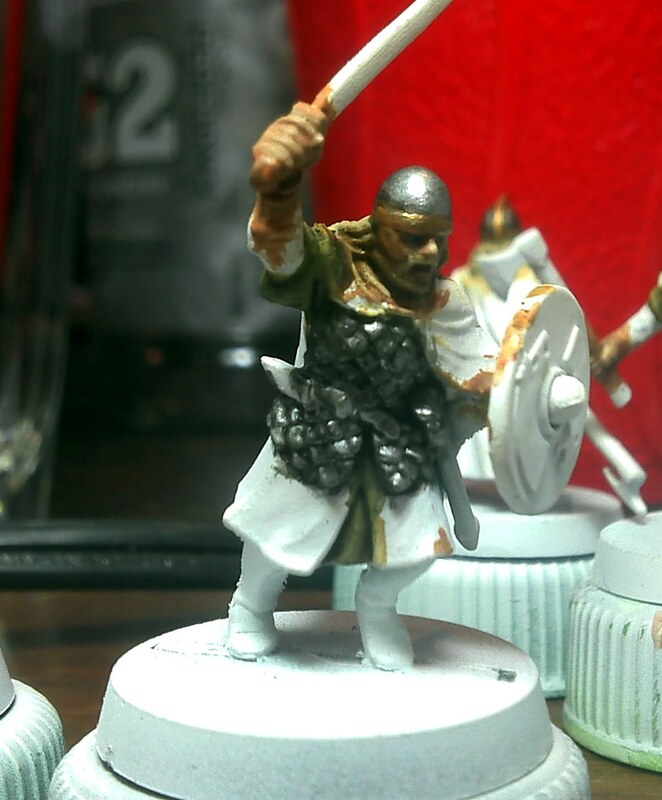 There is one very odd pose for some of the pikemen as well. Odd enough that I'm not quite sure how they are supposed to be holding the pike. I have gone through the Bicorne site and I'm just not quite sure what figure it is to even ask for advice on it. The second lot was much cleaner and had a mix of Bicorne, Perry and Warlord. I probably won't bother with the two boxes of plastic Warlord Games infantry although I may pull some officers out of there. 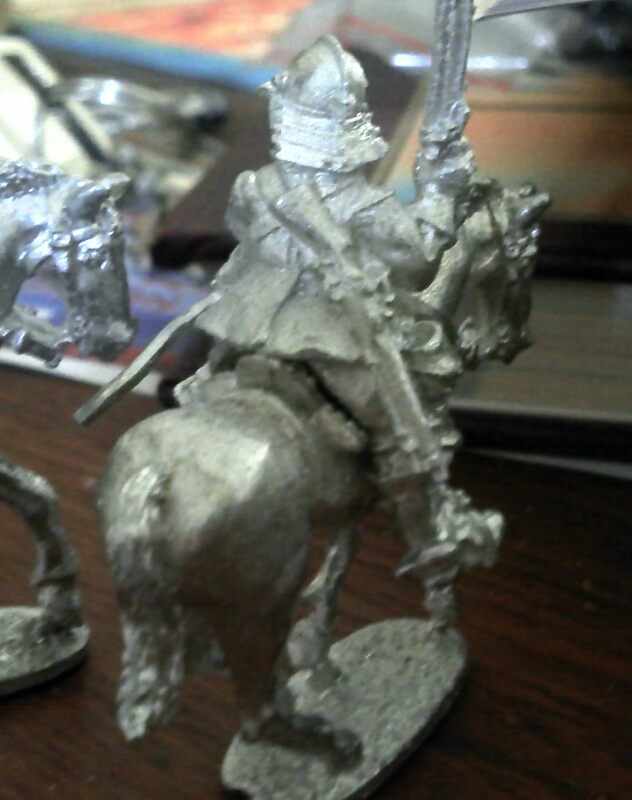 Again there is a bunch of Cavalry (including Dragoons!) from all three manufacturers. 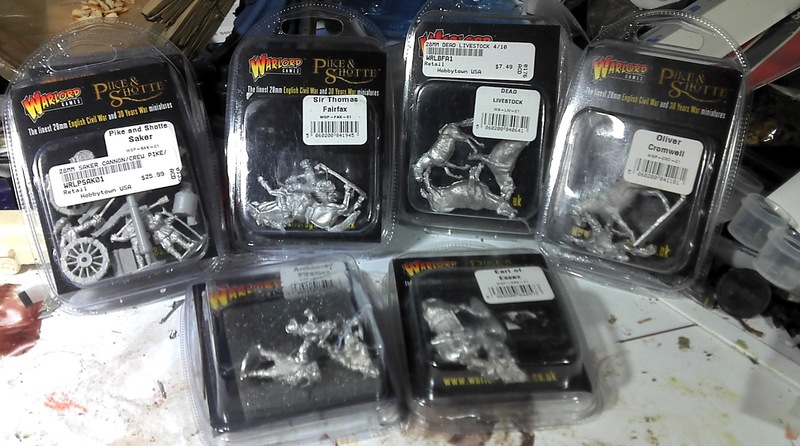 Plus a lot of Bicorne Pikemen and a smattering of Warlord Games metal Pikemen. There are some personality figures from Bicorne and Warlord Games. 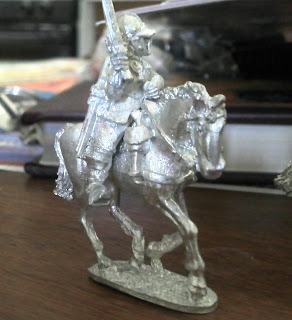 Included in the personalities is the Warlord Games' version of Fairfax who is on one of the worst sculpted horses I have ever seen (the sculpt of Fairfax himself is quite nice). I think the best use of this horse is to use it as a dead one, that would give me the added satisfaction of getting to stomp on it (I learned that little trick from Chris Fitzpatrick, owner and primary sculptor of Crocodile Games. He has also sculpted for GW and Ral Partha). 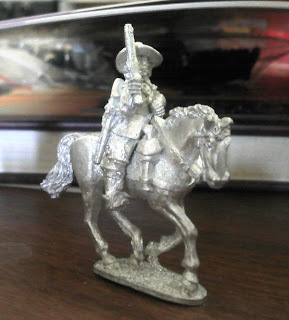 In general I dislike Warlord Games pewter horses, they just never seem to be quite right and the plastic ones drive me crazy since all of the manes hang off on the horses' left side. Crazy enough that I'm probably going to convert at least half of the ones I decide to use to hang off to the horses' right side. 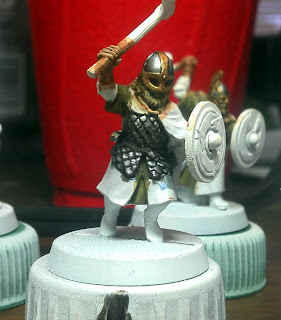 Since it doesn't look like I'm going to get my Normans in time for the convention painting competition this is going to be the army I put together for the show. 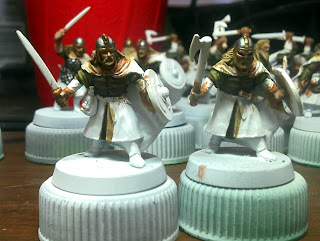 I'll go through the FOG rules and figure out what I need for the Danes but I think I need five units completed for the convention so probably three pike and shotte units and two cavalry units. Should be fun but I have a lot of work in front of me to get these done in time. But then my entry for the convention is almost done now so that's pretty much all I need to work on. 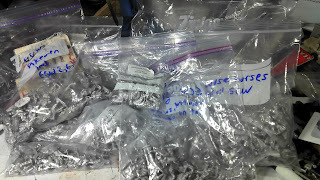 So here are some pictures of the preliminary sorting. I'll do a lot more over the weekend so I can figure out what I need to order for the competition, if I need anything. 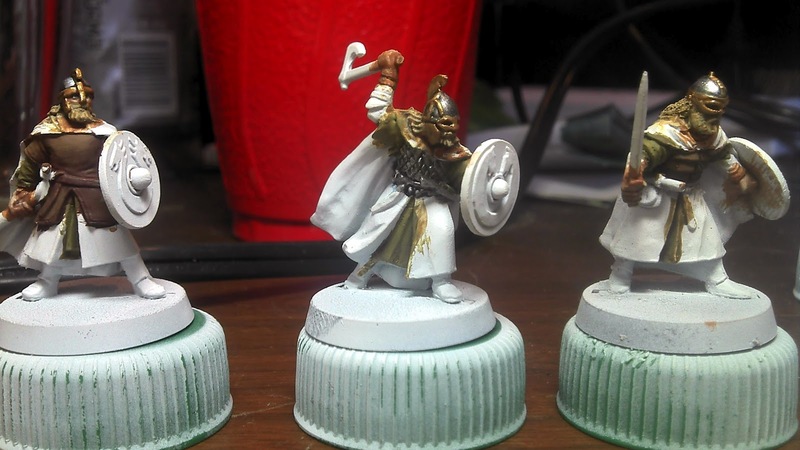 I think I maybe coming up short on command figures for the various units, but I'll figure that out this weekend. Warlord Games Boxsets. I'll use the Cavalry boxes for sure, the horses are plastic but the riders are pewter. Probably will skip the Infantry box. 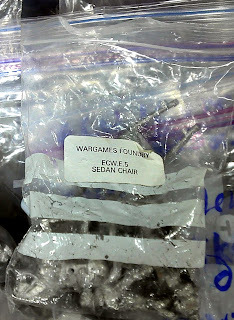 I have a box of Swedish infantry as well but it has metal command figures that I will swipe out of it. Gotta love those little black boxes from Perry Miniatures! 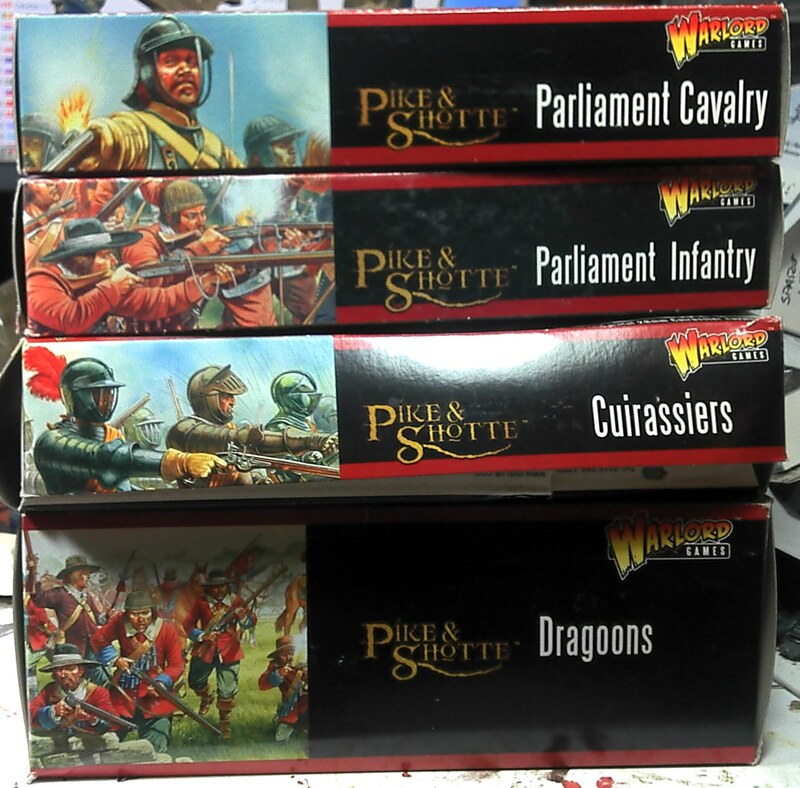 The larger boxes contain Cavalry, and the small boxes have musketeers in them. This is the Wargames Foundry Cavalry that I pulled out of the box. 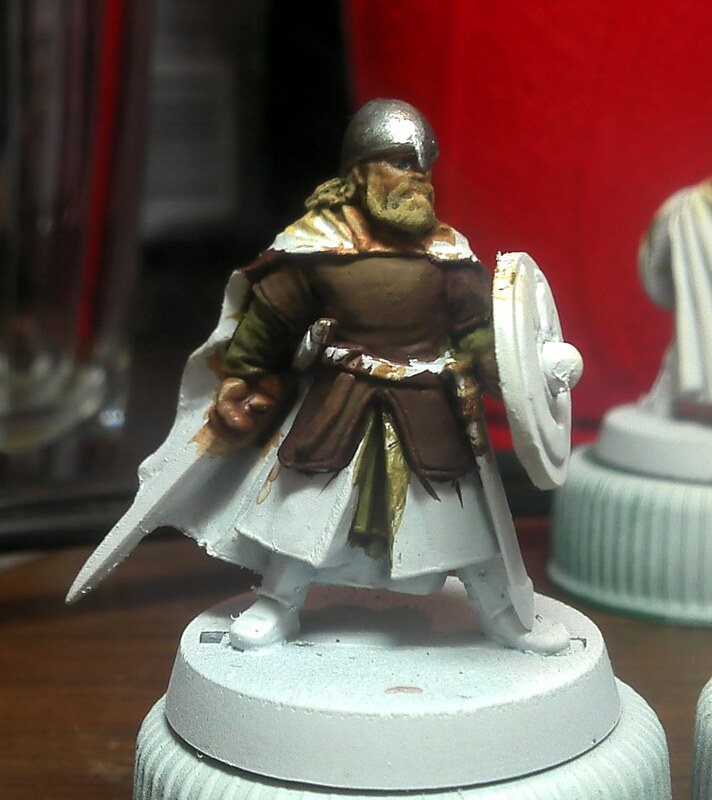 Its going to take some work to get in shape for painting though. This is the stash of Bicorne Miniatures stuff. 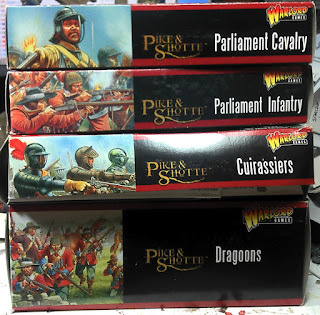 Pike, shotte and more Cavalry! 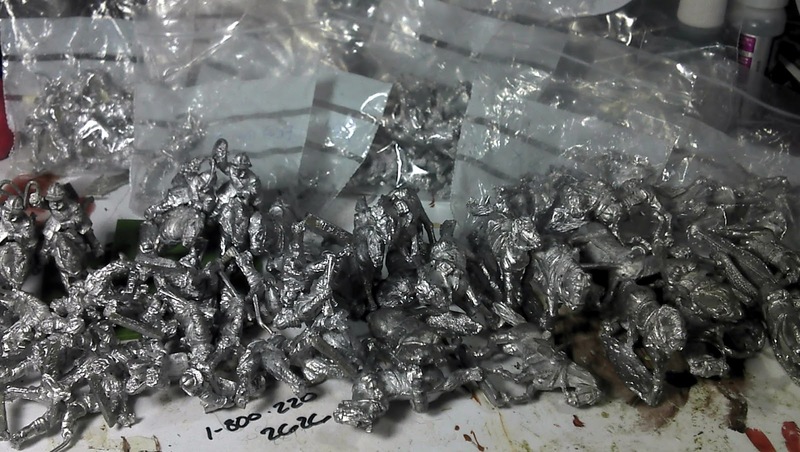 Ziplock bags full of the various infantry and other oddball piece that made up the CA lot. 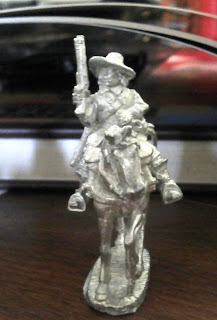 Mostly Bicorne with maybe a third of it from Wargames Foundry. Some of the oddball stuff included, not one but two copies of the Sedan Chair and three copies of the Surgeon's set, will go right along with the dozen or so three horse team limbers. I don't want to make this a news channel by any means but I would like to emphasis that fact the Colorado is facing a tough dry summer. The High Park Fire is at almost 60,000 acres and has destroyed 189 structures making it the most destructive fire in Colorado history. The biggest fire destroyed some where in the vicinity of 139,000 acres but did not approach the structure count that High Park has. I found a very good link that let's you monitor fires throughout the US; http://inciweb.org. There is a statewide ban on open fires in the state right now. Fires can only be started in designated areas within campgrounds, and private fireworks are included in the ban. Although the High Park fire was started by a lightning strike please remember that it doesn't take much to get a fire going in the very arid conditions that exist in Colorado right now. 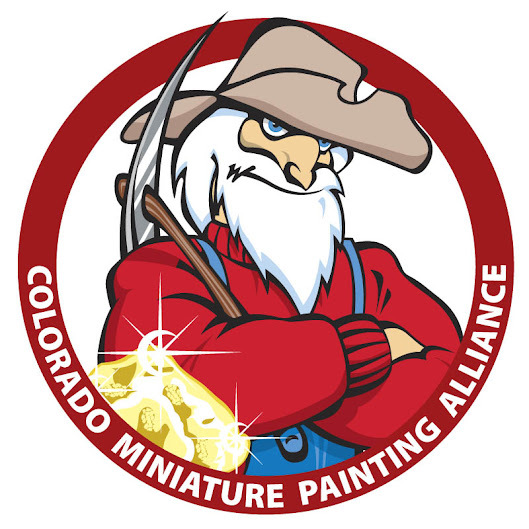 If you are going to vacation in Colorado this summer, which I personally still recommend, or any where in the western US then I would definitely check out this website. This is a late afternoon moonset behind the smoke. When I saw it the moon was blood red, I can't seem to recreate that color in the picture though. Yes, it seems like an odd kind of festival but, of course, its not what you think it is either. 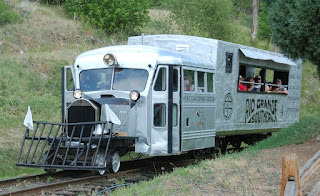 Hobby #2, as stated in the Blog title, is railroads but I can get much more specific about it than that. I'm currently modeling a small area of Los Angeles known as the warehouse district by the locals but as the Patch by the crews that worked it. 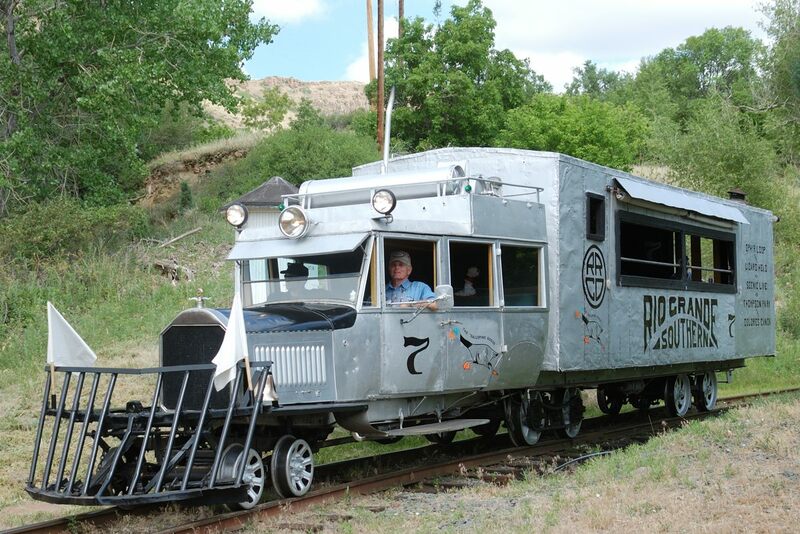 That's my modern day (relatively anyway) model railroading. 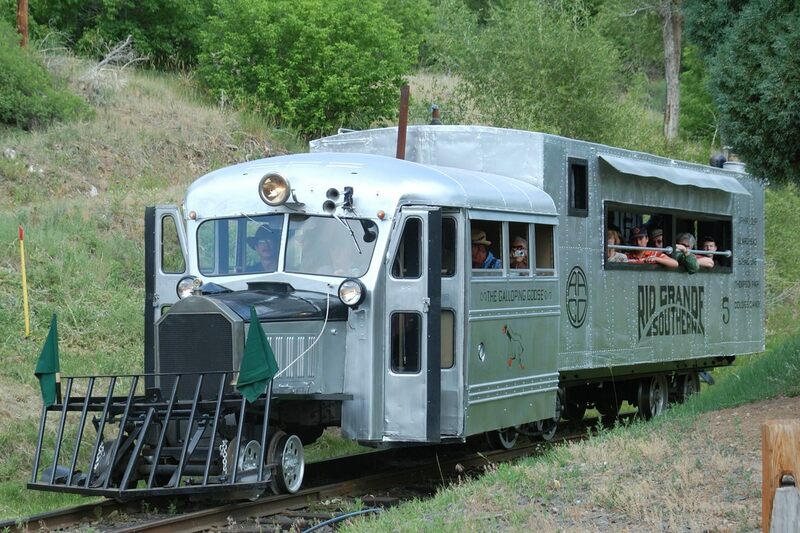 My first love though are the Colorado narrow gauge railroads even though I don't model narrow gauge (at least currently) I love the images of the railroads working their way deep into the mountains. The Goose Fest though involves perhaps some of the oddest "locomotives" to come out of the mountains; The Galloping Geese of the Rio Grande Southern. The City of Telluride, Colorado owns No. 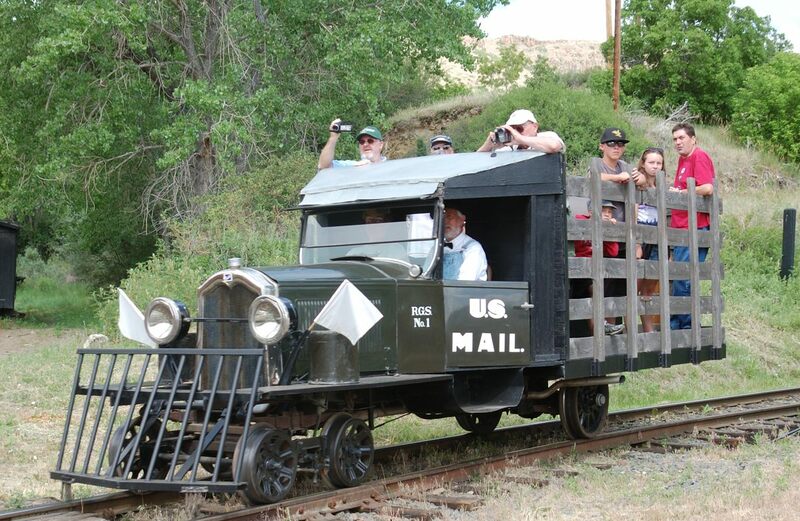 4 (which has just been restored back to service) Karl Schaffer, from Ridgway, Colorado has built a replica of No. 1. Although it was not present for the festival, Goose No. 3 still exists and can be found at Knot's Berry Farm in California. Originally it was also going to be present but dropped out at the last minute. 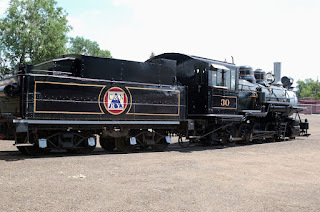 The Colorado Railroad Museum itself is the home of many other narrow (and standard) gauge freight cars, locomotives, and a wonderful library. If you are visiting the area I highly recommend a visit to the museum to get a real sense of Colorado history. Goose #1, A reproduction. The original provided parts to build Goose #2. Goose #4. This is the later configuration with a bus front replacing the original Pierce-Arrow front. 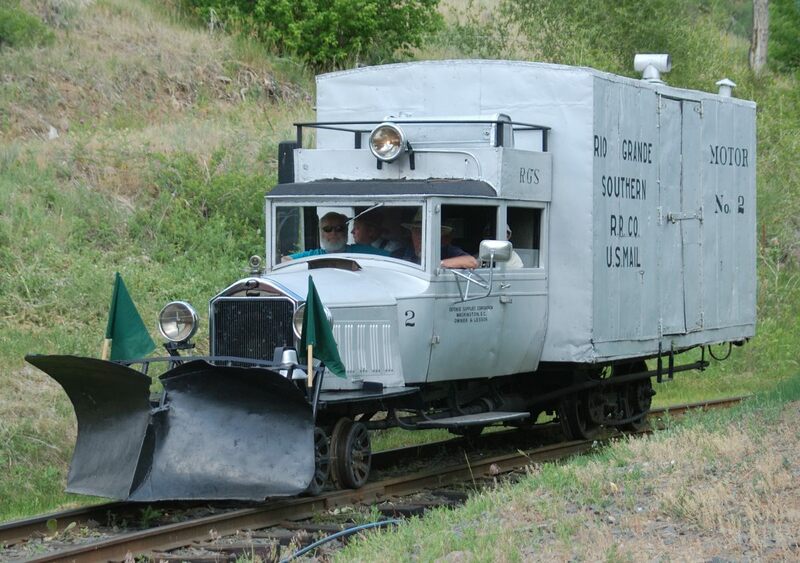 Goose #6 is the work Goose and was used by railroad workers to perform maintenance. Goose #7 with the original Pierce-Arrow front end. This is the front end that Geese 4 and 5 were built with. And what's a day at a museum with a some pictures of some of the other inhabitants? 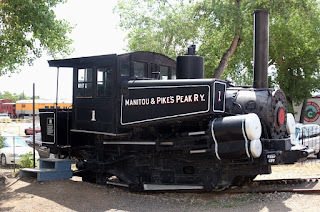 This is a cog engine, that was used on the tourist line that goes up Pikes Peak. 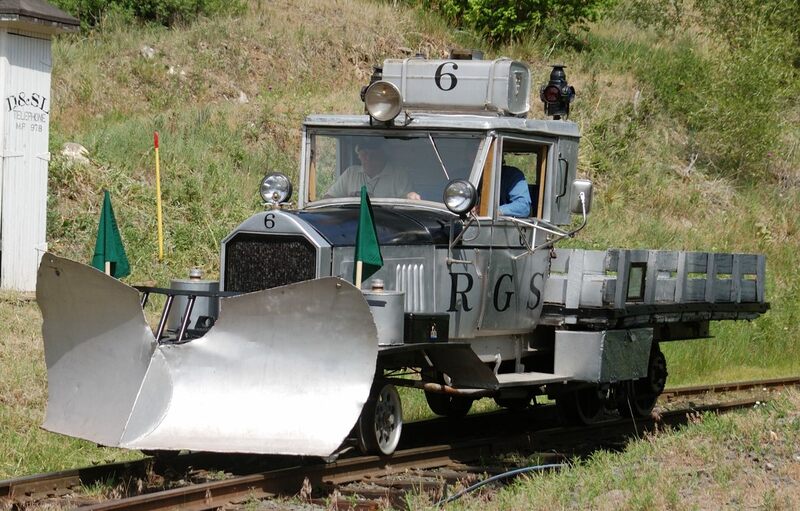 The engine is at an angle so that the boiler will stay level while the train ascends the step grades. 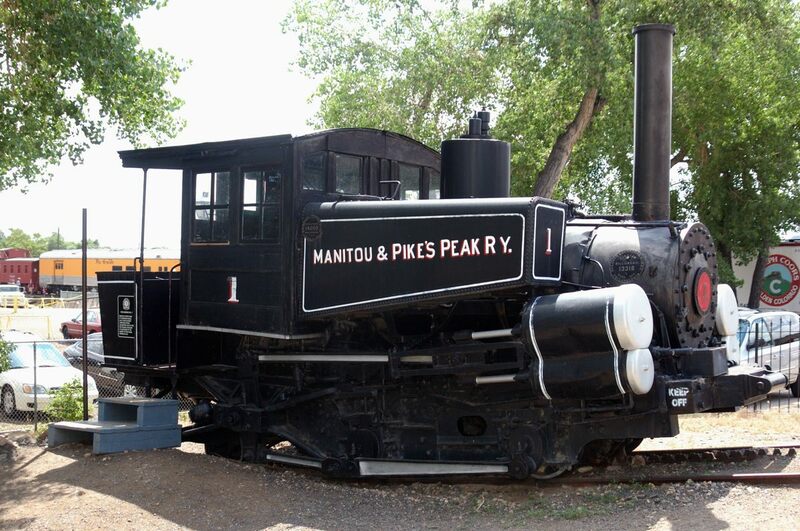 This line still operates today but uses some much more modern locomotives to get to the top. 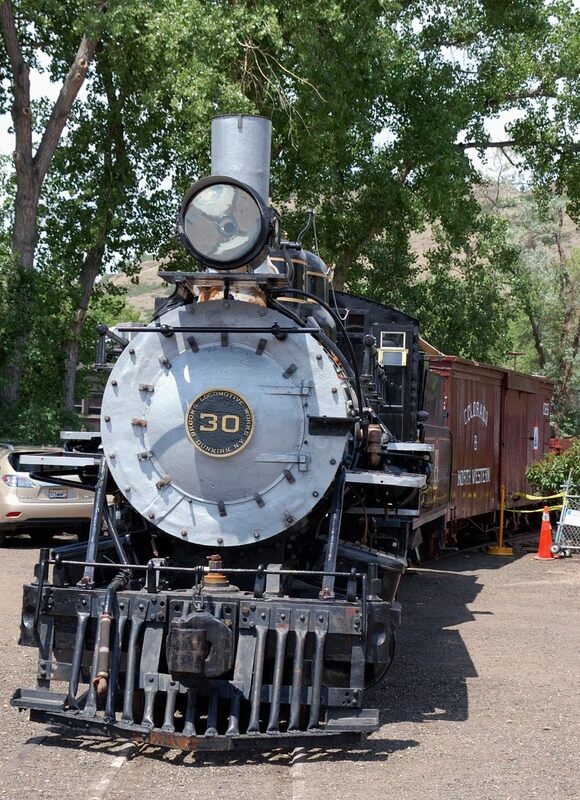 Here's a steam locomotive of the Rio Grande Southern (RGS). No. 318 is a 2-8-0 Consolidation, built in 1896. 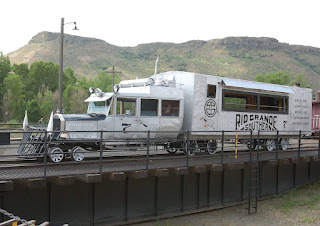 She first worked for the Florence & Cripple Creek RR, then was purchased by the RGS and ended her days on the Denver & Rio Grande Western (D&RGW) in 1953. And last but certainly not least is No. 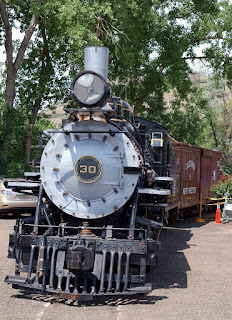 30 of the Colorado and Northwestern RR. 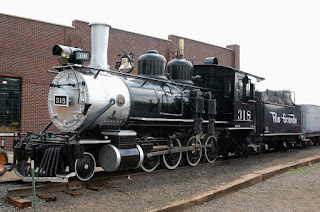 Built in 1886, she and her two sisters (31 and 32) were the largest purpose built narrow gauge locomotives at the time. 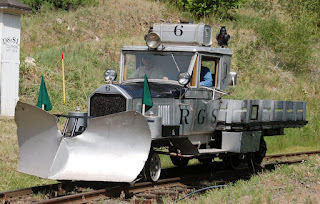 They would go on to work on the Colorado & Southern as Nos. 74, 75 and 76. No. 30 (74) would go on to work on the Rio Grande Southern as No. 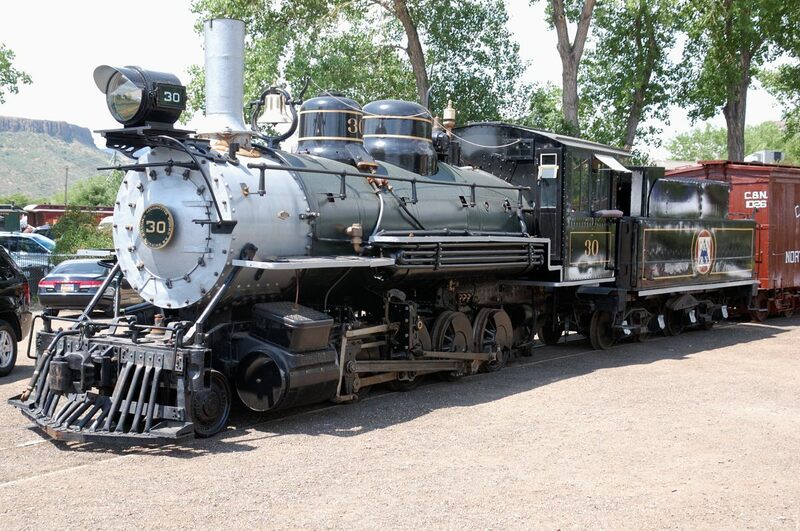 74 as well and was returned to Boulder Colorado in the 50s where she stood in the city park till the 90s. 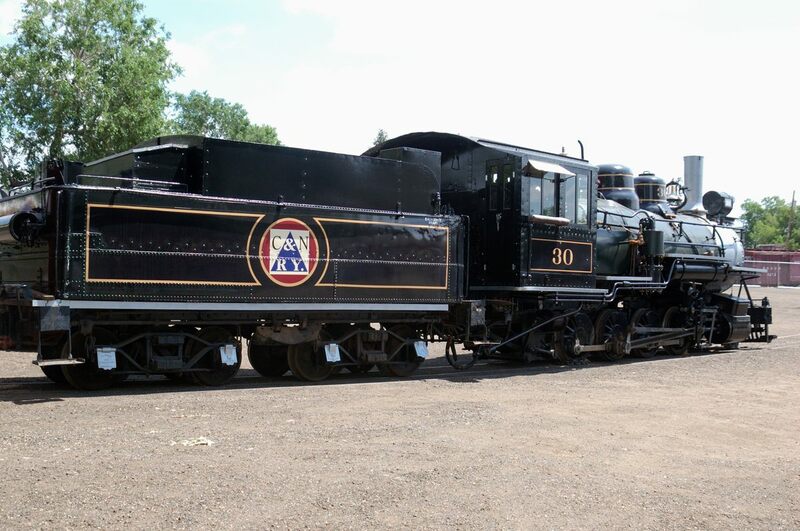 She was moved from the park with the intent of restoring her to operating condition to work on the Georgetown Loop Railroad, but when that became prohibitive (they calculated that they would have to replace 90% of the components) she was sent to the Colorado Railroad Museum to at least serve as a non-operating display. The Colorado and Northwestern is the narrow gauge line that I would like to model, in fact it is model railroad #2 but I'm going to re-create her in standard gauge instead. I have managed to catch up couple of more BNSF coal trains heading south (full) and north (empty) coming through Denver near Broadway. I have finally got started on the first of my Rohan warbands. I admit that I have lost a little steam because the tournament I was looking forward to playing in has been cancelled. 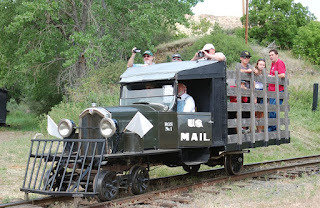 The organizer had to move to Grand Junction for a job. So I'm through the faces, hair, helms and a start on the armor. So here are the first results (not very impressive, I might go back and rework a few things).